Gross. And not in a punk rock way. I bought these for him back in May. Look, it's documented. This means his shoes are good for FOUR months. Is this normal? I thought only toddlers went through shoes like this. But he hates being in stores (sweaty palms, panicked eyes, grabbing my arm and leading me to the door - I'm not exaggerating). And the NB's were too narrow for him. So Sunday I forced him to shop online as the F&F expired at midnight. Perhaps virtual shopping is the answer? 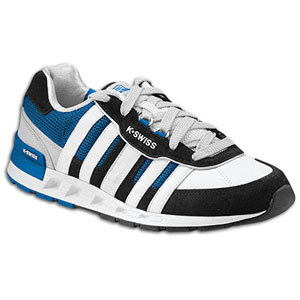 K Swiss sneaks on sale for $39.99. Well, no, he might as well have been in Foot Locker on 34th Street. He hardly looked at the screen, his palms got sweaty and, after I put one item in his shopping basket, said "Ok, now put the computer away." Really, even though you haven't gotten the running shorts and 2nd pair of shoes you so desperately need and have been begging me to buy for weeks? 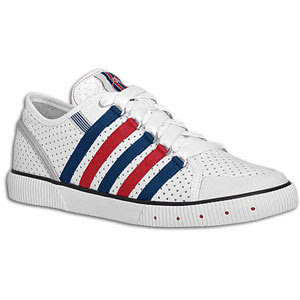 I forged on, fighting him off as he tried to grab the laptop from my hands, and managed to click on another pair of striped KSwiss. 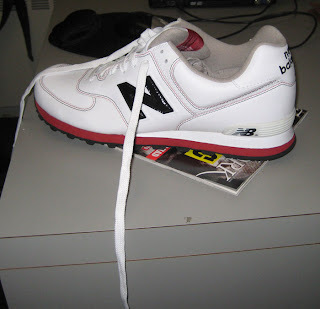 I don't care if these have thorns built into the leather, I am not returning these shoes. And from now on I'm making him go to 34th Street. That way I'll get it right the first time and save on shipping. Plus he can't wrestle me in public, right? LOL @ thorns in the leather. Dude Shopping Fear is a very real thing. I feel for you both. 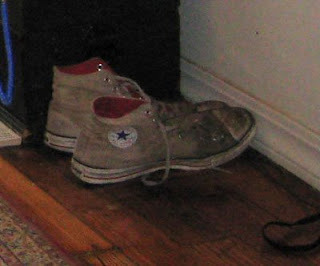 Additionally, what does your hubby do for a living that his Cons become so soiled? Is he a swamp scientist? hahaha! swamp scientist! no, he's an artist, and works with oil paints. you know, all the stuff that's messy and toxic. Oh dear Miss Fashion, thorns in the leather? Ouch! We think you should be a little more definitive on the topic. We now have an image of a brooding, deep, intense artiste as your Spousal Unit. shopping for guys can be so frustrating! They are often so specific.. Some people will do ANYthing to avoid shopping. Love the comparison with shoes for toddlers! That's about how long my shoes last too. wait, lipstick, your shoes or the kids?! but i guess it doesn't matter b/c you're chasing toddlers, so you're going through shoes as fast as they are! Not normal, not ever! Husband needs a visit from the Despotic Queen and stern talking to about shoe care. Princess - lucky for me, he keeps the intense brooding for the paintings. trendology - specific, I know, weird! enc - I know! anything! imelda - emergency, fire up the despot jet, please. farren - good luck with that! although I get my man to help me with colors, esp. with makeup - he's the best with color. Farren: Oddly enough, we think we know such a man. He does the clothes and shoe shopping for his fabulous wife (who inexplicably has no stomach for it), and shows no signs of being gay (my gay-dar is pretty good, and no bells are ringing). All I can figure is -- something snapped with him. We are also trying to keep this little fact a secret from the rest of the guys, as they might try to eliminate him, in the name of upholding the party line . . . I'd like to meet this guy to see if he's for real, anonymous. I have more shoes than my wife (who works in fashion), and am actually trusted to buy her (expensive) shoes as gifts. I don't recall anything snapping, and I love women (only). I don't like many guys but can infiltrate/adapt when necessary. Am I a freak too?